Square's contraption, that allows you to rake in credit card payments with your iPhone, has now received its own placement in the Apple Store, marking somewhat of an endorsement for the technology by Cupertino. Founded by Twitter's Jack Dorsey, Square is a simple approach to the convoluted art of accepting credit card payments on the go. A small square (of course) gizmo plugs into the standard audio jack of your iPhone or iPod touch, and you can swipe a credit card in its slot to process the payment with the supplied free app. The fee is 2.75% per transaction, which is steeper than what the rumored NFC payment fees are to be, but that infrastructure still isn't in place, while Visa, Master Card, and the like, are everywhere. This solution will complement nicely an eventual NFC integration in the next iPhone, that has been inferred to for so long now. Most analysts predict that this year will be pivotal for NFC projects, and in 2012 we will see the technology become mainstream. 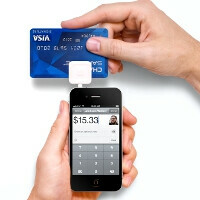 In the meantime, Apple can hedge its bets with Square's solution. It costs $9.95, but there is a one-time $10 credit for creating an account, so basically the device comes for free, and the app is free as well. 2.75% from each transaction isn't, though, but merchants are paying about that to Visa or Master Card anyway, Square or not. This is really cool. I just wish all new cool things weren't available only for iPhone. I just got my square cc reader and have not set it up yet, Is there a phone number to someone I can call and speak with personally to set it up and ask some questions to?